As you know, cancer patients that under chemotherapy usually lose their hair. It happens because chemotherapy drugs reach hair follicles during the treatment and cause damage to them. 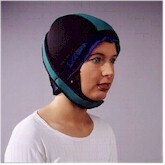 Once of the effective methods to prevent it is the so called scalp cooling. In practice, you put on a special chilled cap that helps scalp blood vessels shrink so they let a less amount of bloodstream through. As a result, your hair follicles receive less oxygen, less nutrients but at the same time less chemotherapy drugs, and that is the key point here. Thus, scalp cooling can minimize the damage that can be caused to your hair by drugs and prevent or significantly reduce hair loss. All you need is just to put on the cooling cap for about half and hour before you take in the drugs and in some cases for some time after the treatment, because you scalp should be cooled as long as the drugs stop circulating in your vessels. For different people this method works differently, but the majority of cancer patients report significant reduce of hair loss with scalp cooling. Copyright © 2010 head of hair. All Rights Reserved.